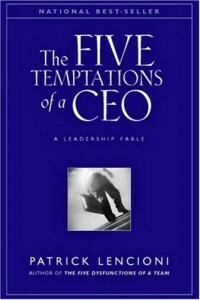 The book, the 5 Temptations of a CEO is a wake-up call to all those who dare to lead. Patrick Lencioni uses the path of fiction to get this powerful message across to all those who wish to succeed in life. The book is to be used as a tool and a reminder that success as a leader comes down to practising a few vital behaviours – behaviours that are difficult for each of us to master. As easy as it must seem to just incorporate a few behaviours to achieve success, it is not as simple. Before bringing in a change within you, the realization to bring about a certain change has to come about. Lencioni narrates the story of a CEO, Andrew, and how he faced his failures and rectified them by not playing the blame game. This book is not just any other self-help book which directs you to incorporate a few attributes within yourself and success is guaranteed. In fact, it is a self-reflection to overcome the grea-test challenges faced by a CEO in order to avoid getting trapped by the daily complexities of this world. For this to happen we must embrace the 5 temptations, which Lencioni explains in a very interesting way in his book. The importance of these temptations does not lie in the fact that they are difficult to understand but because they are natural behaviours which humans are vulnerable to adapt to. Lencioni takes a sneak peek into the stressful life of Andrew and uses that as a benchmark to shed light on the various behaviours that CEO’s adapt while being in power, which eventually affects the business in a negative way and ultimately the CEO himself. So, put on your reading glasses and get ready as it is time for some self-reflection to evaluate yourself through the eyes of Charlie! You may be more interested in protecting your career status than you are in making sure your company achieves results. After achieving ultimate status and with the company going through a rough patch, CEOs make decisions that protect their egos to avoid making decisions that might damage them. This, in turn, is harmful for the company and ultimately the CEO, which he doesn’t realize at that point. Too often, CEOs justify their own performance even when the organizations they lead are failing around them. Lencioni gives a solution to being a victim of this temptation in that CEOs need to make results the most important measure of personal success or step down from the job. The future of the company should not be reliant on the ego of its CEO! This temptation is evident when Charlie asks Andrew what was the best day of his career and the reply he gets was the day Andrew was promoted to be a CEO and when his salary was raised. The author is not suggesting that being happy for your own achievements is wrong but that a CEO should not be as proud as he is to actually doing something with their status and not ego. The desire to be liked by their peers is a dangerous problem for CEOs. They conduct performance reviews far less not because they are lazy but because they do not want to upset their peers. Ironically, these CEOs will not hesitate to lay off the same sub-ordinates when they are not meeting the expectations of the company thereby further damaging the relationship. The solution does not lie in hiring a new employee or firing a present one but to provide constructive or negative feedback. CEOs need to work for the long term benefit, of their employees, not their affection. Direct reports are not to be seen as a support group but as key employees who must deliver on their commitments to produce predictable results. The application of this temptation is seen when Andrew tells Charlie how he fired the marketing head one fine day without holding him accountable earlier or giving him a warning or a deadline. It is the responsibility of a CEO to extract the maximum potential out of his employee rather than just lay him off when the company is at a difficult point. This is the temptation to choose certainty over clarity. Some executives fear being wrong so much that they wait until they do not have all the information before they make a certain decision. This does not mean that a CEO should be hasty and take ambiguous decisions but taking quick decisions with limited information is an art which CEOs must acquire. There are many situations in which waiting for all the information is not possible and so one needs to be very sharp in anticipating, forecasting and reaching a decision. The advice Lencioni gives to CEOs is that they should hire people who are smarter than them. This leads to effective decisions and better forecasting techniques. CEOs should remember that people will learn more if they take decisive action rather than just waiting it out. If the decisions turn out to be wrong when more information becomes available, a CEO can easily explain why and change plans. Good decisions can only be made if all the honest opinions of the peers are laid out on the table. One way of doing this is by encouraging brainstorming sessions, focus groups and other techniques. Another way is by conflict. By conflict, the author means productive ideological conflict. Conflict is healthy as people speak their minds freely and so decisions can be made by taking the full benefit of peoples’ ideas. Lencioni advises that CEOs should be able to tolerate discord. Directs reports should be encouraged to speak their minds. Refraining from personal attacks, healthy conflict is essential for creativity and clarity. Generally CEOs keep their direct reports at a distance as they do not encourage direct reports being too comfortable with them. This is because they feel that they might lose their credibility or not be taken seriously because of the general perception of being a CEO as someone who is very powerful. Even having productive conflict within the peers, the latter will not feel safe to object or disagree to any opinion of the CEO. Being in a powerful position, CEOs need to encourage their people to challenge their ideas. This will develop a relationship of trust between the CEO and the direct report; the former will be able to trust the latter in matters of reputation and in return will get respect and confidence. The seriousness of the temptations lies in the fact that they are all susceptible to human beha-viour. Each and every temptation is essential to avoid failure and to succeed. Since each one can have dire consequences, they cannot be ignored. The result of one temptation is interdependent on the application of the other. There-fore, it is a chain that has to be followed to achieve success completely. In a nutshell, the author stresses on choosing results of the company over personal status; focussing on accountability over popularity when dealing with direct reports; making clarity more important over certainty when making decisions; encouraging positive conflict over harmony to stimulate mind and ideas; and trusting your employees with your decisions by being vulnerable to them. From a psychological point of view, if one ponders on these temptations, one comes to realize that they are deeply rooted in the human mind. CEOs usually make what is called the fundamental attribution error. This is a tendency to over-value personality based explanations for the observed behaviour of others while under-valuing situational explanations. It is only a matter of self-reflection, to understand your subconscious mind and the forces driving your behaviour, that these temptations can be avoided. The driving force of these negative temptations is the CEO’s ego. Due to the fear of being wrong and perceived by others in a negative way, one ultimately gives in to this vicious cycle. Therefore, it is important to reflect on yourself and your actions time and again and take feedback from others as power does come with a price a price to not just be accountable for yourself but also for your company and employees. Maryam Salman is a graduate of the University of Waterloo, Canada. She did her Bachelors with Honours in Psychology. Returning to Pakistan, she started working for a renowned psychiatrist, Dr. Fariha Piracha and was doing volunteer work at the Fountain House. Maryam did majority of her psychology courses in organizational behaviour, worker motivation theories, ethics training and others involving business psychology. Maryam is currently working for Coca-Cola in their Public Affairs and Communications Department as PR executive.